I recently talked about 4 big ways that keyword search is evolving in 2019. One of the major shifts in internet search behaviour has been Google prioritising their featured snippets, which sit atop their search engine results pages (SERPs). If you use Google to answer simple questions, you’ll be familiar with the featured snippet. Let’s say you want to know what the highest mountain is: before, you would probably click the first link, which meant some traffic for Wikipedia. Now, Google will answer that in their featured snippet, a little box which precedes any links—which means no traffic for anyone but Google. This is a minor inconvenience for a site like Wikipedia, but it makes a huge difference for firms doing business online, who depend on inbound traffic. This means a new kind of competition. Rather than merely competing for a spot on the first SERP, there’s a tremendous advantage to be gained for whatever company convinces Google to excerpt their content as part of the featured snippet. Here are some best-practices to raise your company’s chance of becoming Google’s featured snippet. Speaking broadly, Google’s featured snippets take a journalistic approach to search queries. This means that they’re trying to answer the classic questions of who, what, where, when, why and how. This is why their featured snippets, also called ‘rich snippets’ or ‘direct answers’, turn up in response to simple queries. More complex queries are less likely to return such clear-cut results. However, the presence of featured snippets on SERPs has been growing, due to factors like machine learning. 3 years ago, less than 10 percent of Google queries returned a featured snippet, now it’s around 50 percent. This means optimising your content to become a featured snippet is sensible today, and may be mandatory tomorrow. The good news is that if you’re doing business online, you’ve probably already taken the first steps. Google’s approaches featured snippets the same way they do keyword searches: they want to return the best results. So the same principles apply here. If you want to compete to be the featured snippet, create clear page titles, meta tags, keep keywords in mind, and so on. Google also weighs a website’s authority for the featured snippet the same way they always measure a site’s authority, so you will be mostly be relying on your pre-existing skills here. This is another step you’re used to. You’re already analysing your inbound traffic analytics to see which keywords are competitive. Now, since you know where your site is competitive, focus on those areas first. Keep in mind that Google is looking to answer basic questions first. Identify a post that fits this template neatly. Do you have a post or page that answers who, what, where, when, why or how? That would make a perfect candidate. Research has shown that Google prizes clear phrases that are between 40 and 50 words. When you set out to be Google’s featured snippet, aim for something in this range. Research has shown that the easier you make it for Google to parse your site, the higher your likelihood of being chosen as the featured snippet. This means that Google prizes things like paragraph and heading tags, and other formatting touches, will be make your content more attractive to the algorithm. According to Rob Bucci, Moz’s VP of research and development, 29 percent of Google SERPs’ featured snippets were tables in 2017. A table is a good example of how diversifying your content will increase your odds of becoming the featured snippet. A table answers a question with a clear wording that’s easy for a search algorithm to parse. It is an economical use of words, since the categories and headings are briefer than full sentences. Think along these lines. An FAQ or an interview also provides opportunities to answer questions in a clearly worded and concise way. Think of building a content calendar with these issues in mind and you’ll raise your chances of becoming the featured snippet. Just as keyword search is always evolving, so is the featured snippet feature. A few months ago, tech journalists noticed that Google was choosing snippets from videos. 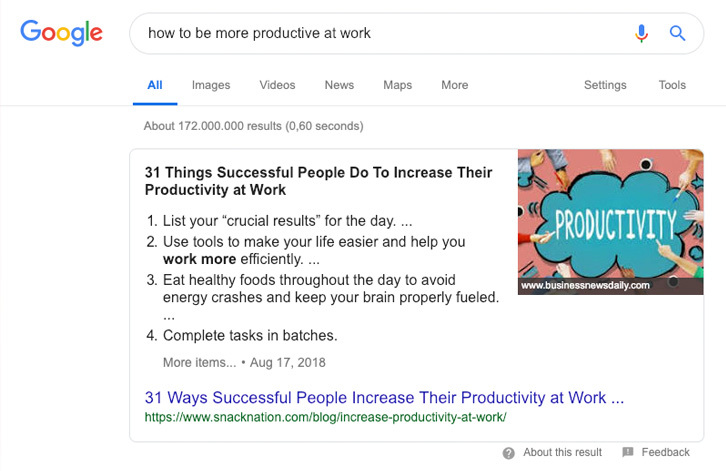 As of December 2018, Google will link users directly to the portion of the text that the featured snippet is quoting. Getting your site selected as Google’s featured snippet is the next field of competition, so make sure your business isn’t left behind!